Jaundice refers to the yellow appearance of the skin that occurs with the deposition of bilirubin in the dermal and subcutaneous tissue. Normally in the body, bilirubin is processed through the liver, where it is conjugated to glucuronic acid by the enzyme uridine diphosphate glucuronyl transferase (UGT) 1A1. This conjugated form of bilirubin is then excreted into the bile and removed from the body via the gut. When this excretion process is low following birth, does not work efficiently, or is overwhelmed by the amount of endogenously produced bilirubin, the amount of bilirubin in the body increases, resulting in hyperbilirubinemia and jaundice. In most infants with physiologic jaundice, bilirubin concentrations do not rise to a point that requires treatment. However, in some infants with exaggerated physiologic jaundice, and in many infants with pathologic jaundice, bilirubin in the blood reaches very high concentrations that put the infant at risk for acute and chronic bilirubin encephalopathy (kernicterus). In these cases, treatment aimed at decreasing bilirubin concentration is required in order to avoid kernicterus. Etiologies of hyperbilirubinemia in newborns are provided in the image below. 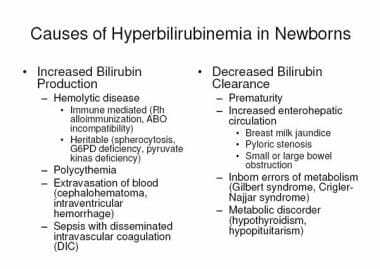 Causes of hyperbilirubinemia in newborn infants. Adapted from Maisel MJ. Neonatal Jaundice. Pediatrics in Review. 2006; 27: p. 445. Effective treatments to decrease bilirubin levels in infants with severe jaundice include phototherapy and exchange transfusion. The effect of light on jaundice in neonates, and the ability of light to decrease serum bilirubin levels, was first described by Cremer et al in 1958. This observation led to the development of light sources for use in the treatment of infants with hyperbilirubinemia, a treatment now referred to as phototherapy. Since its inception, phototherapy has been effectively used as a relatively inexpensive and noninvasive method of treating neonatal hyperbilirubinemia. [4, 5] The decline in the number or exchange transfusions in recent years is, at least in part, likely a direct reflection of the effectiveness of phototherapy at treating hyperbilirubinemia. In modern neonatal ICUs (NICUs) exchange transfusions are rare and are only used as a rescue therapy to avoid kernicterus in newborns with severe jaundice when phototherapy is inadequate. At its most basic, phototherapy refers to the use of light to convert bilirubin molecules in the body into water soluble isomers that can be excreted by the body. The absorption of light by normal bilirubin (4Z,15Z-bilirubin) results in the creation of 2 isomeric forms of bilirubin: structural isomers and configurational isomers. The main structural isomer of bilirubin is Z-lumirubin. The main configurational isomer of bilirubin is 4Z,15 E -bilirubin. Configurational isomerization is reversible, and structural isomerization is irreversible. Both the configurational and structural isomers of bilirubin are less lipophilic than normal bilirubin and can be excreted into bile without undergoing glucuronidation in the liver. Some of the configurational isomers of bilirubin, however, revert back to the native form after excretion into bile and can be reabsorbed via enterohepatic circulation in the gut. Structural bilirubin isomers, like Z-lumirubin, can also be excreted in the urine. 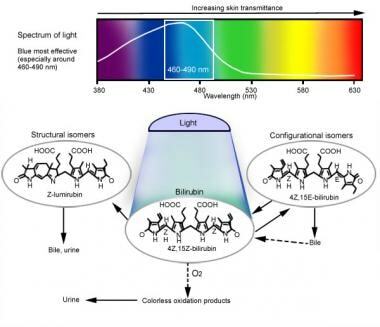 The absorptions of light by bilirubin also results in the generation of excited-state bilirubin molecules that react with oxygen to produce colorless oxidation products, or photooxidation products. This process occurs more slowly than configurational or structural isomerization. Photooxidation products are primarily excreted in the urine. The image below provides a schematic of the conversion of normal bilirubin to configurational isomers, structural isomers, and photooxidation products and the respective routes of excretion from the body. Mechanism of phototherapy: Blue-green light in the range of 460-490 nm is most effective for phototherapy. The absorption of light by the normal bilirubin (4Z,15Z-bilirubin) generates configuration isomers, structural isomers, and photooxidation products. The 2 principal photoisomers formed in humans are shown. Configurational isomerization is reversible and much faster than structural isomerization. Structural isomerization is slow and irreversible. Photooxidation occurs more slowly than both configurational and structural isomerization. Photooxidation products are excreted mainly in urine. Adapted from Maisel MJ, McDonagh AD. Phototherapy for Neonatal Jaundice. N Engl J Med. 2008;358:920-928. Prior studies have shown that approximately 5-40 infants per 1,000 in the United States require phototherapy in the newborn nursery, and an equal number require readmission to the hospital for phototherapy after discharge from the nursery. The specific total serum bilirubin concentration at which phototherapy should be initiated varies and depends on several factors, including the total serum bilirubin level, the infants gestational age, age of the infant in hours at the time of testing, and any individual risk factors for hyperbilirubinemia. Risk factors for the development of severe hyperbilirubinemia and kernicterus include isoimmune hemolytic disease, glucose-6-phosphate deficiency, asphyxia, significant lethargy, temperature instability, sepsis, acidosis, and hypoalbuminemia (< 3g/dL). To aid physicians in the decision on when to initiate phototherapy, the American Academy of Pediatrics Subcommittee on Hyperbilirubinemia developed guidelines on the management of hyperbilirubinemia in newborns 35 or more weeks’ gestation. This guideline includes an algorithm for the management of jaundice in the newborn nursery as well as guidelines for the initiation of phototherapy based on total serum bilirubin levels, gestational age, age of the infant in hours, and individual risk factors. This article discusses the clinical procedure for providing phototherapy for neonatal jaundice. The effectiveness of phototherapy at converting bilirubin into configurational isomers, structural isomers, and photooxidation products is determined by the dose of phototherapy provided to the infant. The dose of phototherapy depends on several factors, including the spectral wave length of light, the spectral irradiance delivered to the infant’s skin, and the total spectral power (average spectral irradiance delivered across the surface area of the infant). Factors that affect phototherapy are described in the image below. Factors that affect phototherapy: The 3 factors that affect the dose of phototherapy include the irradiance of light used, the distance from the light source, and the amount of skin exposed. Standard phototherapy is provided at an irradiance of 8-10 microwatts per square centimeter per nanometer (mW/cm2 per nm). Intensive phototherapy is provided at an irradiance of 30 mW/cm2 per nm or more (430–490 nm). For intensive phototherapy, an auxiliary light source should be placed under the infant. The auxiliary light source could include a fiber-optic pad, a light-emitting diode (LED) mattress, or a bank of special blue fluorescent tubes. Term and near-term infants should receive phototherapy in a bassinet and the light source should be brought as close as possible to the infant, typically within 10-15 cm. However, if halogen or tungsten lights are used, providers should follow the manufacturer recommendation on the distance of the light from the infant to avoid overheating. Preterm infant can be treated in an incubator, but the light rays from the phototherapy device should be perpendicular to the surface of the incubator to minimize light reflectance. Adapted from Maisel MJ, McDonagh AD. 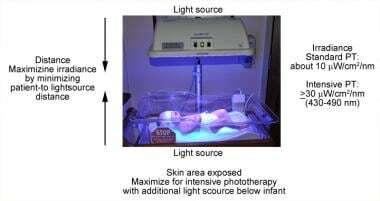 Phototherapy for Neonatal Jaundice. N Engl J Med. 2008;358:920-928. Spectral power increases as the amount of skin exposed to phototherapy increases. Ways to increase surface area exposure include removal of clothing and increasing the number of lights/lighting devices used to deliver phototherapy. Infants receiving phototherapy should be left only in their diaper, allowing adequate surface area exposure for phototherapy. The use of lights both above and below an infant effectively doubles the area of exposure. Several manufacturers produce fiberoptic pads that can be placed under the infant. The Bili Bassinet (Olympic Medical; Seattle, WA) is one commercial device that provides special blue fluorescent tubes that emit light in the 460-490 nm wavelength, both above and below the infant. Eye protection should be placed on all infants receiving phototherapy. The need for eye protection is based on animal data that phototherapy may be damaging to the retina. Various commercially available infant eye shields are available for use. In addition to eye shields, many centers also prescribe lubricating eye drops (carboxymethylcellulose sodium) for infant receiving phototherapy. The infant's temperature should be closely monitored while receiving phototherapy. This is especially important in infant under halogen lights because these emit significant amounts of heat and can cause hyperthermia. Unclothed infants in basinets under fluorescent or light-emitting diode (LED) devices are at risk for hypothermia, especially if they are in an area with a low ambient temperature. Premature infants and infants unable to maintain body temperature in a basinet should be placed on a radiant warmer or in an isolette while receiving phototherapy in order to maintain normothermia. Phototherapy has been safely used for the treatment of neonatal jaundice for over 40 years. Complications from phototherapy are rare and generally mild. The two most notable complications include increased insensible water loss and cutaneous reactions in infants with cholestatic jaundice receiving phototherapy. Maisels MJ, McDonagh AD. Phototherapy for Neonatal Jaundice. N Engl J Med. 2008. 358:920-928. Maisel MJ. Neonatal Jaundice. Pediatrics in Review. 2006. 27(12):443-453. Cremer RJ, Parryman PW, Richards DH. Influence of light on the hyperbilirubinemia of infants. Lancet. 1958. 1:1094-1097. Slusher TM, Olusanya BO, Vreman HJ, Brearley AM, Vaucher YE, Lund TC, et al. A Randomized Trial of Phototherapy with Filtered Sunlight in African Neonates. N Engl J Med. 2015 Sep 17. 373 (12):1115-24. [Medline]. Slusher TM, Vreman HJ, Olusanya BO, Wong RJ, Brearley AM, Vaucher YE, et al. Safety and efficacy of filtered sunlight in treatment of jaundice in African neonates. Pediatrics. 2014 Jun. 133 (6):e1568-74. [Medline]. [Guideline] American Academy of Pediatrics. Management of Hyperbilirubinemia in the Newborn Infant 35 or More Weeks of Gestation. Pediatrics. 2004. 114 (1):297-316. Francisco Sweeney NM. Neonatology. Custer JW and Rau Rachele. The Harriet Lane Handbook. 8th Ed. Philadelphia: Elsevier Mosby, Inc.; 2009. 497. Gomella TL. Hyperbilirubinemia. Neonatology. 4th Ed. Connecticut: Appleton & Lange, Stamford; 1999. 235. Muchowski KE. Evaluation and treatment of neonatal hyperbilirubinemia. Am Fam Physician. 2014 Jun 1. 89 (11):873-8. [Medline]. [Full Text]. Tan KL. The pattern of bilirubin response to phototherapy for neonatal hyperbilirubinemia. Pediatric Research. 1982. 16:670-674. Messner KH, Maisel MJ, Leure-DuPree AE. Phototoxicity to the newborn primate retina. Invest Ophthalmol Vis Sci. 1978. 17:178-182. Zhang AY, Elston DM. Drug-Induced Photosensitivity. Medscape Reference. Available at http://emedicine.medscape.com/article/1049648-overview. Accessed: April 25, 2011. Maayan-Metzger A, Yosipovitch G. Hadad E, Sirota L. Transepidermal Water Loss and Skin Hydration in Preterm Infants During Phototherapy. Am J Perinatology. 2001. 18(7):393-396. Furchgott RF. Endothelium-dependent relaxation, endothelium-derived relaxingfactor and photorelaxation of blood vessels. Semin Perinatol. 1991. 15:11-15. Grunhagen DJ, De Boer MG, De Beaufort AJ, Walther FJ. Transepidermal Water Loss During Halogen Spotlight Phototherapy in Preterm Infants. Pediatric Research. 2002. 5(3):402-405. Maisel MJ. Why use homeopathic doses of phototherapy. Pediatrics. Pediatrics. 1996. 98:283-287. Seidman DS, Moise J, Ergaz Z, Laor A, Vreman HJ, Stevenson DK, et al. A new blue light-emitting phototherapy device: A prospective randomized controlled study. J Pediatr. 2000. 136:771-774. Chang PW, Kuzniewicz MW, McCulloch CE, Newman TB. A Clinical Prediction Rule for Rebound Hyperbilirubinemia Following Inpatient Phototherapy. Pediatrics. 2017 Mar. 139 (3):[Medline]. Olusanya BO, Ogunlesi TA, Kumar P, Boo NY, Iskander IF, de Almeida MF, et al. Management of late-preterm and term infants with hyperbilirubinaemia in resource-constrained settings. BMC Pediatr. 2015 Apr 12. 15:39. [Medline]. [Full Text]. Infant under Ohmeda halogen lamp with eye protection. Infant under neoBLUE phototherapy light and lying on fiberoptic phototherapy blanket. neoBLUE light-emitting diode (LED) phototherapy radiometer. neoBLUEcozy light-emitting diode (LED) phototherapy bed. neoBLUE light-emitting diode (LED) phototherapy lamp. neoBLUE light-emitting diode (LED) phototherapy system. The views expressed in this manuscript are those of the author(s) and do not reflect the official policy or position of the Department of the Army, Department of Defense, or the U.S. Government.